FILE - A brigade from the Puerto Rico Electric Power Authority repairs distribution lines damaged by Hurricane Maria in the Cantera community of San Juan, Puerto Rico, Oct. 19, 2017. The storm struck after the authority had filed for bankruptcy in July, put off maintenance and had finished dealing with outages from Hurricane Irma. 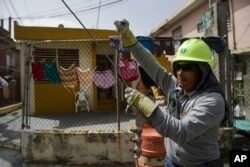 Individuals long familiar with the inner workings of Puerto Rico's publicly owned power authority say it should come as no surprise that the island was left entirely without electric power by Hurricane Maria or that, more than two months later, more than half its residents are still without electricity. The late September storm hit the U.S. territory with unprecedented strength, leveling buildings and even whole forests with winds in excess of 250 kilometers per hour (155 mph). But former and current officials of the Puerto Rico Electric Power Authority (PREPA) say a decades-long culture of neglect and corruption had left the system unnecessarily vulnerable to Maria. FILE - Men push a generator along Fortaleza street, one month after Hurricane Maria, in San Juan, Puerto Rico, Oct. 20, 2017. Long before Maria, signs of the power grid's delicate state were everywhere. During Hurricanes Hugo in 1989 and George in 1998, Puerto Ricans were left without power for up to three weeks, especially in remote areas. On September 21, 2016 — a year to the day before Maria left the island — a fire in PREPA's southern Aguirre plant caused an island-wide blackout for six days. ● The vast majority of power lines in Puerto Rico are suspended on reinforced concrete poles designed to withstand winds of between 225 and 240 kph, meaning they should have held up through most of Maria's blast. But, according to former PREPA Executive Director Josue Colon, cable and telecommunications companies have been allowed to string their own fiber-optic cables on the poles, reducing their wind load capacity by an average of 80 kph. Existing law requires these companies to coordinate with PREPA, but all too often, Colon said, they "just do what they want" without proper oversight or regulation. ● Generating units in Puerto Rico's petroleum-based electrical system date back, on average, 45 years, compared with the U.S. national average of 18 years. When asked, in an interview with local media in 2015, to assess the condition of PREPA's physical assets, a representative of a New York-based consulting firm said they were the worst of any corporation she had previously seen or worked with. ● Once the storm hit, the local government was slow in activating its energy restoration plan. The U.S. company initially hired to repair the grid, Whitefish Energy Holdings, wasn't contracted until six days after Maria, and its crews did not begin arriving on the island until October 2 — 12 days after the power was knocked out. Florida, in contrast, had mobilized thousands of crews from around the country to begin work the day after Hurricane Irma subsided that same month. FILE - power lines lay broken after the passage of Hurricane Maria in Dorado, Puerto Rico, Oct. 16, 2017. PREPA's executive director is required by law to report by May 31 each year on steps that have been taken to prepare for hurricanes or "other atmospheric disturbances." That plan should include details of companies that have been contracted to initiate repairs in the case of a storm. However Senator Carmelo Rios, majority speaker in the Puerto Rico legislature, said in a radio interview this month that this year's report was not filed until August 30 — less than three weeks before Maria struck — and that it falsely claimed the utility was fully prepared to deal with any contingency. Neither the governor's office nor that of PREPA Executive Director Ricardo Ramos responded to VOA's requests for comment. ● An individual with personal knowledge of PREPA's workings, who declined to be identified while talking about company-employee relations, described systemic corruption that has allowed critical equipment to deteriorate while highly paid and underperforming employees are protected. Reports that date back over 25 years, prepared by engineers charged with overseeing the corporation's operations, show that PREPA employees on average perform only two hours of useful work per day. Yet a menial custodial position can pay upward of $90,000 a year with generous benefits. UTIER, the union representing PREPA employees, has also negotiated severe restrictions on what employees can be asked to do, creating inefficiencies. Drivers, for instance, cannot help with any other work, even if that means they must wait and watch while others work. UTIER did not respond to repeated requests for comment from VOA. Inconsistent PREPA leadership has compounded other problems, with a new territorial administration appointing a new PREPA governing board every four years since 2000. This has affected PREPA's ability to design, implement and execute a long-term strategic plan to solve its fiscal problems and prepare for emergencies. FILE - Ezequiel Rivera works with the Puerto Rico Electric Power Authority to restore distribution lines damaged by Hurricane Maria in the Cantera community of San Juan, Puerto Rico, Oct. 19, 2017. 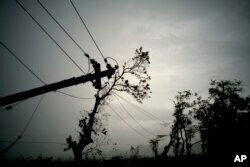 The same type of problems that contributed to the island-wide blackout now threaten to plague the recovery effort. Numerous local officials and environmental activists have argued strongly in favor of replacing the destroyed infrastructure with a decentralized electric grid, developing hundreds if not thousands of microgrids that can provide power to smaller sectors closer to where the power is being generated. However, Colon points out that a network of seven such grids was already established across Puerto Rico as an emergency backup, but it was inoperable after Maria because of a lack of maintenance. He blames this on draconian austerity measures implemented by Alix Partners, the New York consulting firm brought in three years ago as PREPA neared insolvency. VOA reached out to Alix Partners for comment by email, Facebook and Twitter but did not receive a reply. The Army Corps of Engineers estimates that power in Puerto Rico may not be fully restored until March. Governor Ricardo Rossello, however, has publicly stated his goal of restoring power to 90 percent of the island before Christmas. In reality, when power will be fully restored in the U.S territory is anybody's guess.